While picking out a new vehicle in your favorite color and options at Sanford Honda is fun and exciting, it is what comes after the sale that keeps the good vibes going for years. 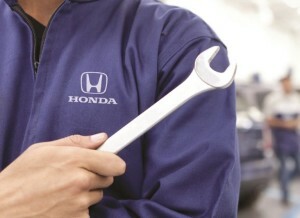 Honda service is every bit as important as financing, and is what keeps your vehicle like new for years! The service staff here have it all down to a perfect process. They continue to take care of you long after the handshake with exceptional service and extended Sanford Honda service hours on Saturday for those who don’t have enough time during the week. The staff views Honda service as an extension of the sales experience, meaning they treat you and your new vehicle like family for years to come. That is why customers continue to come back, no matter where they live within the Sanford area. So trust the local service technicians with everything from routine maintenance like an oil change to major engine work to keep your Honda running like the day you bought it. Sure, our service technicians are highly trained and capable of carrying out nearly any repair, maintenance or warranty work. They also understand that you have a busy schedule and do not want to spend all day just trying to get in line and get serviced. So when that check engine dash light comes on, the weekend Sanford Honda service hours make it easy to get in and out quickly without hassle. Browse our website and take advantage of the available online tools that make it all as easy as clicking a button. From the ability to schedule a service appointment online to taking advantage of service specials and discounts, you can do it all online. More of a do-it-yourselfer? You’ll love being able to order genuine Honda parts from us and having the backing of the manufacturer for quality assurance. Finding high-quality Honda service in Sanford, NC, is as easy as going online or using your mobile device, so come be a part of a long-lasting relationship that starts with friendly sales experiences and ends with exceptional Sanford Honda service for many years.